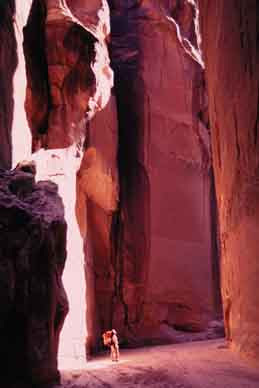 You cannot imagine a human feeling smaller under the face of the earth than in place in the bottom of Buckskin Gulch. The walls simply tower so high above at times that human size are like ants by comparison. It is awe-inspiring and awesome. I know nothing to describe or compare. Pictures are just inadequate. Dont do justice to the grand scale of things. It was all frozen when I was walking. Many of the hikers are repeatedly wet during warmer months. It can be impossible to turn around because deep pools of water prevent you from going upstream once you have slid over boulders to enter the pool beneath them. It can be a hike that plays for keeps. But the beauty is beyond description. I did most access cross country hiking. Not supposed to do that. I didn't ask permission, only the rooks were watching. It was my solitary experience. I also visited a mountain mesa called the White House nearby. Camped out on Paria River area for three days. Never saw another person the whole time. It was very special to me. I have never told about it before. Thanks for sharing that. This kind of solitary experience is truly a treasure. Although I have a great time with my family, it is a very different kind of experience. Darrin and I were just talking about solitary time and how wonderful it is. I especially like time alone in God's creation. This is a place of timeless beauty, where you can park you car, put on a pack, walk away from it all, and be lost in wilderness splendor for as long a time as you'd like, an hour or a week, or a year. I mean it.